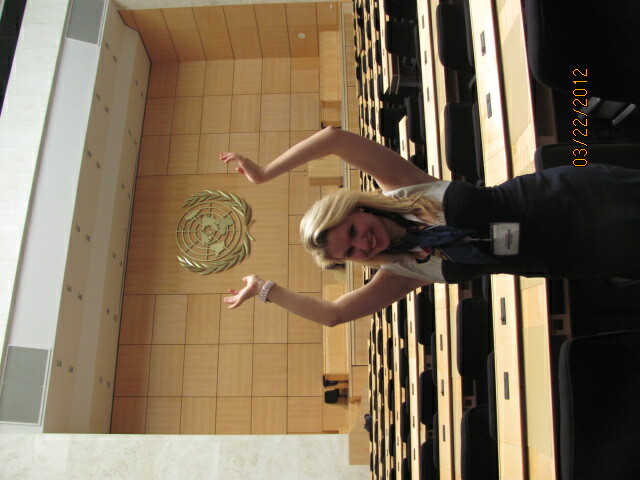 Head delegate Katie James '14 in the Assembly Hall of the UN Palais des Nations at the 2012 Geneva International Model UN conference. Typically, during Model UN conferences, I am used to being amazed when others tell me where they are from. Germany, France, Belgium, Hong Kong, Sri Lanka, India, it is all fascinating and intriguing. This time, it was me who was the interesting one, being from New York. While most of the time at GIMUN was spent giving speeches and debating policies to alleviate poverty and hunger, during the coffee breaks we were truly able to discuss our diversity. The delegates from France seemed to enjoy hearing me say “creme brulee” and “tiramisu” and often asked about schooling in the States. The delegate from Germany took a keen liking to me and the other members from the USA, always wanting to know about the Republican elections and the politics of the United States. My favorite part of these breaks would be when my neighbor, who was from France would give me chocolate. Each day, he would come in with a different kind and have me try them. On the last day of conference, he took us to the duty free chocolate shop at the Palais des Nations! Who knew the UN had such a sweet tooth? This entry was posted in News, Student Delegate Blogs and tagged Belgium, chocolate, diversity, France, Geneva, Geneva International Model United Nations, Germany, GIMUN, Hong Kong, India, Katie James, Model UN, Model United Nations, MUN, Palais des Nations, Sri Lanka. Bookmark the permalink.